When I joined tech startup Gusto in 2014, we were a scrappy team of 40 crowded into a rundown SF office space that comfortably fit, well, less than 40. We had two water coolers, one in the kitchen, and one in a main office area adjacent to a few couches that we affectionately called the “living room.” When the kitchen water cooler broke, the living room cooler was moved to the kitchen. You’d think that moving it to the next room, a leisurely 10-second walk away, wouldn’t be a significant change, but the new location turned out to have surprisingly large reverberations that drove home the power of the literal, and proverbial water cooler. 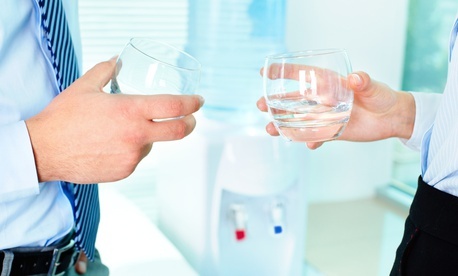 Because of the added distance, we no longer engaged in short conversations by the water cooler. And with less water intake, we had fewer encounters while waiting in line for our single stall bathroom. With these two conversation spots missing, I found I didn’t ask “How’s your day going?” or “What are you working on?” as often. I missed hearing about my colleagues’ last amazing customer calls or tricky engineering bug fixes. Overall, it seemed harder to keep up with what was happening…harder to feel connected. As a former operations efficiency consultant, I wasn’t surprised that moving things made a difference in productivity, however, I was surprised how much our community could shift as a result. At Gusto’s next office location, we learned this lesson again. We decided to serve lunch at the most central area in the office to make it equally convenient for everyone. We thought it’d make it easier for everyone to eat together and then get back to work. But we made it too easy: Employees began to eat at their desks much more often. Later, after we outgrew our 4th floor office, we shifted to serving meals on the 2nd floor of our building (the only other space available for our expansion at the time). I expected that employees would grudgingly trek the two floors to get food and bring it back to their desks. The outcome? My understanding of human behavior expanded when nearly all employees started taking a full lunch period on the 2nd floor—initially (and very practically) because it was too much of pain to take it back to the 4th floor to eat. While they were down there, they might as well enjoy it! Thus, a highly communal and lively lunchtime evolved, and dare I say, thrived. Over the next several years, we experimented with intentionally placing food and drinks in a way that would encourage employees to interact. We would stock different snacks in different locations, to encourage employees to wander where they might not normally go. We realized the power of placement in creating gathering places. But why bother with gathering places? Brene Brown, a research professor at the University of Houston who has studied human connection for decades summarizes in her book Daring Greatly, “We are hardwired to connect with others, it’s what gives purpose and meaning to our lives, and without it there is suffering.” While it may seem dramatic to say that not having a water cooler leads to suffering, UCLA psychology professor and research scientist Matthew Lieberman’s research shows that our need for connection is as strong as our need for food or water, and that social pain is actually real pain. While actual water coolers are quite useful tools in creating places to gather, in today’s workplace, it is the metaphorical water cooler that matters. And companies are evolving their “water coolers”—from ERGs to social events to virtual #water cooler Slack channels. Communities start when people gather around things they care about, and as many organizations strive to be more inclusive, cultivating and investing in water coolers is more important than ever.